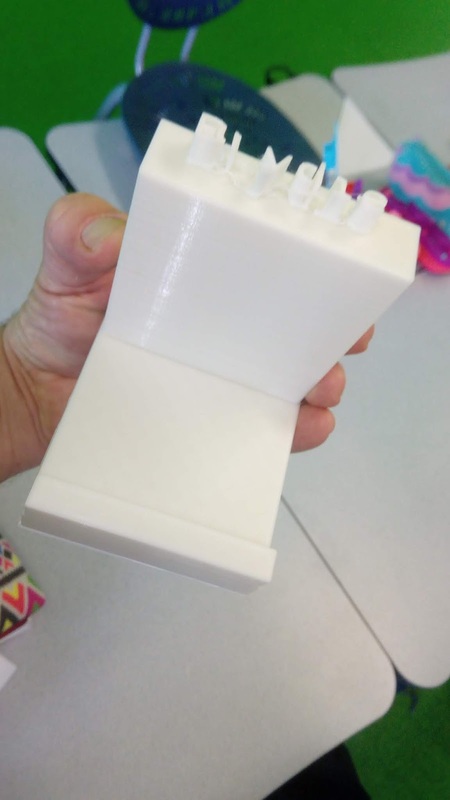 Challenge: For student to create an iPad stand that was able to be printed in the realistic shortest possible time. Student had seen a number of classroom examples, many of which have been featured as posts shown on this blog. Background: The student was interested in producing this to allow her to have her iPad on a stand. She had seen various versions around our classroom and was looking at a way to minimise the size. She was asked to personalise the design and she choose to put her name on the top (as shown) and an apple design on the back of the stand. The naming aspect was produced from the basic Tinkercad design 'typing' feature. 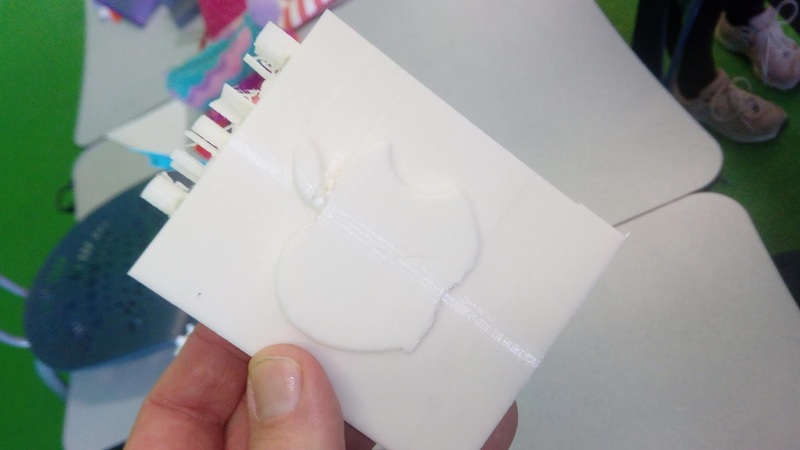 The 'Apple' design on the reverse of the design was sourced from Tinkercad, using a generic search. 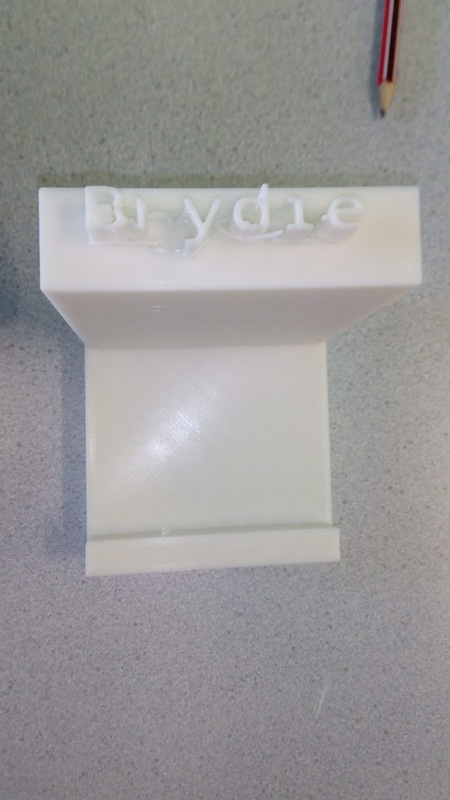 The student involved in the production of this 3D Print was a nine year old student who was creating her first major 3D project, and has been working with printers for the first time. Level of Difficulty: Medium - this student was able to produce this successfully with her first version of the design. The emphasis on producing as smaller iPad stand as possible directed the design in part. Timeframe - Eight hours. While this may seem considerable if you reference the print times of the other iPad stands, which were generally in the twelve hour range. Given all aspects of the print it would not be practical to reduce the print design in size further, to still be able to have an iPad sit safely on it. Size: The design was 100mm across, 120mm long and 20mm thick. The design block at the rear of the design was 100mm high. The lettering with the name of the student was 20mm high raising from the top of the block. What we would do differently: Minimal - the student created this design and was extremely pleased with the results, the design and the use of the iPad stand. The student had a specific goal in mind with this process and was able to achieve this. We have been mixing PLA with projects to produce different effects from the design. The student choose not to use this technique and instead printed this as a single block, however on the balance of things this would be a minor consideration. Next Steps for student: Given the success of the process the student needs to challenge herself to move onto other projects. Challenge: Student was challenged to use a previous print, that had not be successful and create something individualised, that had a purpose. The student choose initially to select the base of the 3D Printed Glow-In-the-Dark base. Student then choose to mount two unicorns on the base. Student is nine years old. because they had a squat flat base, which the student felt would prove more stable than the previous design. Level of Difficutly: Low - the student was not directly involved in the creation of specific parts of the design. The base was a simple rectangle expanded, the Unicorns were sourced from freely available Tinkercad projects. The student was challenged by the front of the design, in the earlier 'Horse' print the student had attempted to sink her name into the design of the plate. Her solution to this was to produce a white filament plate to cover the space were the name had attempted to be placed. The glow-in-the-dark filament is striking and effective however we have had issues withs detailing and finer points of design. Because the details for the name was sunk into the plate the PLA could not really be removed to have a strong effect from the lettering. Finally the hooves of the horse could not be removed completly from the base, we attempted to use sandpaper to remove them, however this proved to less than satisfactory and was not completed, the hooves were considered to be a minor issue as they are 1mm-2mm. Timeframe: The total print time for this project was seventeen hours. The two unicorns that were mounted on the base took five hours to print each. The base was seven hours. While the name plate has not been added to the project, the time for this is expected to be no more than one hour. Size: The size of hte base of the plate for this print is a rectangle. It has a width of 20mm. It was 200mm long and 120mm wide. The unicorns were 50mm by 50mm and 80mm high. What we would do differently: The student was the driver behind this print, hence her desire to use the Unicorn prints and designs. Ideally the student could have designed something original herself but she was intent on using the pre-designed Unicorns for the print. We have had a number of prints this year that have not worked and are looking to use them in some way, another example of this has been the draws that were not size appropirate for meaning that new storage is created. Challenge: Produce a stand, with drawer storage that is personalized. Background: Student wanted to produce a personalized, individualized storage stand, with a working drawer. The drawer in this print came as an 'off print' from the 'horse head' drawer. Wanting to use this draw for another project it was given to a student who was tasked with producing a storage container that fitted with the original draw. The student was able to produce the storage part of the design (shown clearly in black) that matched perfectly with the drawer at the first attempt. Following this, the student designed a Alvin and the Chipmunks design (sourced from online on Tinkercad) to mount on top of the design. 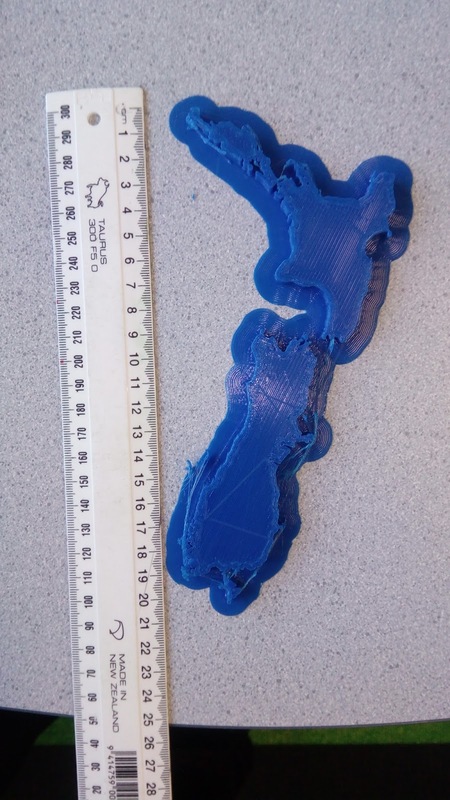 The student concerned with this design is nine years old, using a 3D Printer for the first time in the classroom (since in New Zealand starts school in February we are looking at a four month time frame. Level of Difficulty: Medium-High. This print is involving a series of prints, with the drawer and the base working in conjunction with each other. If the draw was not perfectly working in unison with the storage box then the entire design would not work. Time frame: There are a number of component parts to this print. lettering and the design on the back of the storage box. Size: The base of the design (black PLA) was 145mm long, 100mm wide and 20mm high. At the back of the design the base was 80mm high. The drawer (grey PLA) 85mm wide, 115mm long, 17mm high and between 10mm and 25mm thick. The Alvin and the Chipmunk part of the design was essentially 70mm across and 50mm high. What we would do differently: Part of the design did not work. We had discussed with the student not putting words on the rear of the design, below the unicorn design (see left). The removal of the rafting on the design was not possible without removing some of the lettering. The lettering should have been printed separately (almost certainly it would have been with a different PLA) and then super-glued onto the design. The student has also considered to put her name on the top of the design in front of the Chipmunks. Next Steps for the Student: The student has essentially mastered this design, with the exception of the lettering on the base of the design. The student could look for additional ways to open the drawer. Above: Print project shown in profile. Challenge: For student to produce a individualised storage stand, featuring a draw, personalised by 3D printing complete with multiple filament designs/segments. having some trouble creating a drawer to fit into the base of the design that could be accessed. She also had to experiment with varying degrees of ways to open the draw at the base of the design. Level of Difficulty: Difficult. This has been a long drawn out process which has required considerable reworking and redesign. The print took place in multiple stages and required significant reworking. The original design featured a horse that was built into the stand, this had particularly thin legs, which caused it to to be damaged when it was removed with the rafting. The student then redesigned the print and featured the horse head, shown in the photograph. The mane of the horse trailed below the print, this was solved by the student who printed a base for the horse head to be raised up allowed the mane to trail behind the horse. Initially the name of the student was to have been sunk into the side of the design, into the base of the pink filament. However, the student felt this was unsatisfactory and removed the lettering, and replaced it with the blue block lettering, as shown in the photograph. The final design from the student featured a hole created in the edge of the internal drawer, as she felt this was the preferred option to open the draw. Timeframe: There are multi parts to this project. The base was twelve hours in print length (this needs to be addressed as it featured a horse that was removed from the print base, so one would estimate this would be ten hours or so), the horse head was two hours (sourced from Tinkercad as a freely available print), the blue lettering featuring the students name was an hour, the internal draw was three hours. The entire print time for a project such as this would be in the range of seventeen hours, and this is the minimum requirement for a multi-part project such as this. Size: The project had a number of component parts. The main base was 95mm wide, 140mm long and was hollowed out on the inside (to allow for the storage draw). The base at the back rose 120mm. The horse head was 80mm high and 40mm across, the lettering was typically 20mm high, 20mm across and 10mm thick, although this varied slightly (the horseshoe was 5mm thick for instance). The draw was 120mm deep, 80mm wide and 8mm thick. There could be some variation with the design to meet other requirements (different sized feature on the stand etc). What we would do differently: The print has been ongoing for several weeks for the student to get it to the point that she was happy with it. Printing it in components or stages allowed the different PLA to contrast the colours and she was extremely pleased with that. The initial design featured a pink horse, the student would not have included this had she seen the effect that was created by the blue filament. Next steps for the student: Given all the effort that went into the print the student has completed this to the highest possible level. The draw is the very last stage of the post, that could have been redesigned but the student has spent several days getting the drawer to the stage that it has.